We’d like to extend a warm invitation to participate and/or support this unique course and on-the-ground village sustainability collaboration between Empowerment Works, Living Mandala Foundation, Sacred Earth Trust convening NGO leaders, international students, and local community stake holders for the 7 Stages to Sustainability (7SS) + Permaculture Design + Catalyst Action Training at the UNESCO world heritage site and sacred Buddhist pilgrimage city of Bodhgaya, India – the place of the Buddha’s Enlightenment. This project collaboration unites 7SS and the best practices in Asset Based Community Development (ABCD) with the whole systems design framework and solutionary technologies and applications in Permaculture to be applied on-the-ground at local initiatives in Bodghaya, India and in project initiatives from participants. This training is an ideal capacity building opportunity for NGO leaders and others interested in international sustainable development to increase their skill sets in the field while also completing an internationally recognized certificate in Permaculture Design within the context of integrated sustainable development. With a special focus on social permaculture and cross-sector collaboration, this unique course is also perfect for permaculture enthusiasts seeking to expand and apply their skills for greater impact. Students will learn the skills to apply 7SS and Permaculture in their own organization’s, communities, and project initiatives. This is a rare opportunity to learn both of these powerful frameworks and regenerative design processes, how they can work together, and how they can be be applied some of the most pressing problems facing the world and communities today on a local and international level through cross-sector collaboration and grass roots implementation. In addition to delivering essential 7SS tools for effective implementation of community-led solutions, this 2 week + sustainability intensive will be integrated with a full Permaculture design course focused on utilizing the 7SS and Permaculture Design curriculum towards real projects in the local villages. – 7SS – 8 lectures + 4 labs offering students a clear step-by-step collaboration road map empowering people, businesses and organizations to turn local assets into holistic solutions from the ground up. WHERE: In the Heart of Bodhgaya, India – UNESCO world heritage site and sacred Buddhist pilgrimage city, place of the Buddha’s Enlightenment. Empowerment Works – 501c3 global sustainability think-tank in action dedicated to the advancement of whole-system, locally-led solutions for a thriving world. Living Mandala Foundation – an educational organization and collective of educators working to train local leaders and catalyze project initiatives to implement personal, ecological and socially regenerative technologies. Sacred Earth Trust – NGO to support the sustainable development and environmental protection of Sacred sites and UNESCO world heritage sites around the world, through working in co-operation with the local, indigenous people and international groups. WHY: In addition to delivering essential 7SS tools for effective implementation of community-led solutions, this 2 week + sustainability intensive will be integrated with a full Permaculture design course focused on utilizing the 7SS and Permaculture Design curriculum towards real projects in the local villages and participants. 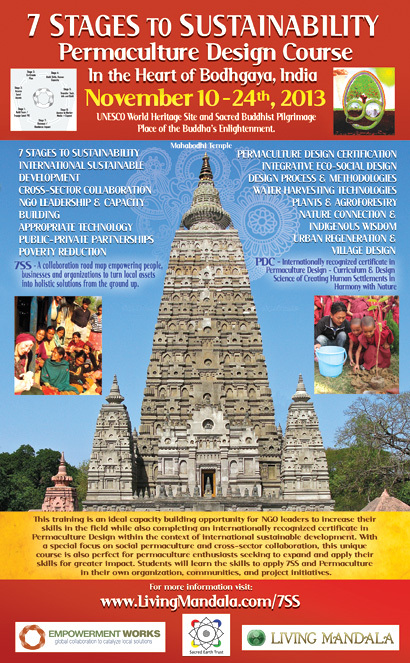 Our intention is to provide a high quality, informative, and life changing experience for students, while catalyzing the 7SS process and permaculture design implementation towards supporting the on-going efforts of sustainable development in Bodhgaya by the local villagers, students, leaders, youth, activists, government officials, & Buddhists monks & nuns in the local community. Inspired by indigenous cultures and embracing leading edge capacity building tools, “7 Stages to Sustainability (7SS)” is a collaboration road map, an Asset Based Community-driven Development (ABCD) framework, philosophy of self-determination and an educational curriculum empowering communities to build sustainable futures from the ground up. Started as a framework in 2001, after several years global grassroots community action, 7SS was developed into a service learning curriculum in China in 2009. Modeling the way nature creates, the 7SS pattern is universal and used world-wide to catalyze innovation in business, technology, music and even movies. In short, 7 Stages to Sustainability is a tool to transform poverty into prosperity in the world’s most economically challenged communities. Permaculture is a holistic design philosophy described as the art and science of creating community ecosystems in which plants, animals, human beings, and all forms of ecological diversity interact to produce a prolific, ecologically-sound, and regenerative system that can support itself and life indefinitely. The focus of permaculture is to design and establish societal systems that provide for humanity’s material and non-material needs including food, water, shelter, energy, economics, and health in a way that is symbiotic and synergistic with the Earth’s natural ecosystems. 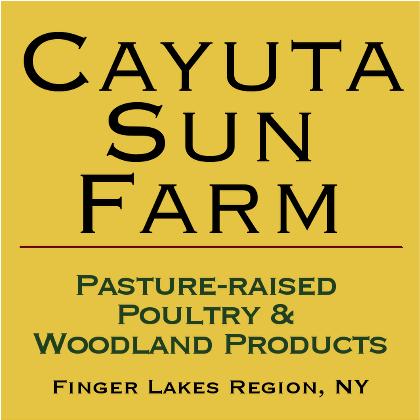 From its inception Permaculture has quickly spread to over 120 countries in rural, suburban, and urban areas where farms, homesteads, communities and businesses alike are successfully applying its ideas, techniques and strategies to create more sustainable and regenerative human settlements in harmony with nature. In industrialized and non-industralized countries alike, these applications hold much promise for dealing with the many issues and increasing global challenges associated with mass populations including clean water, local food, energy, poverty, dependency, and village sustainability. Leveraging this course for social impact in our site community, we are delighted to be partnering with with Empowerment Works & Sacred Earth Trust to bring the 7SS curriculum along with a Permaculture Design Course to the villages of Bodhgaya, India. Utilizing the bio & culturally diverse landscape of Bodhgaya as a design lab, graduates of 7SS + Permaculture course will have the opportunity to participate in the co-development of a follow up intensive, 7SS “Catalyst Action Training” (CAT), facilitated by global team members of Empowerment WORKS – a US 501c3 global sustainability think-tank in action dedicated to the advancement of whole-system, locally-led solutions.